The aim of this study is to examine and assess the nonmetric dental trait evidence for the population history of East and Southeast Asia and, more specifically, to test the two-layer hypothesis for the peopling of Southeast Asia. Using a battery of 21 nonmetric dental traits we examine 7,247 individuals representing 58 samples drawn from East and Southeast Asian populations inhabiting the region from the late Pleistocene, through the Neolithic, Bronze Age, Iron Age, and into the historic and modern periods. The chief data reduction technique is a neighbor-joining tree generated from the triangular matrix of mean measure of divergence values. Principal findings indicated a major dichotomization of the dataset into (1) an early Southeast Asian sample with close affinities to modern Australian and Melanesian populations and (2) a very distinct grouping of ancient and modern Northeast Asians. Distinct patterns of clinal variation among Neolithic and post-Neolithic Mainland Southeast Asian samples suggest a center to periphery spread of genes into the region from Northeast Asia. This pattern is consistent with archaeological and linguistic evidence for demic diffusion that accompanied agriculturally driven population expansion in the Neolithic. Later Metal Age affinities between Island and Mainland coastal populations with Northeast Asian series is likely a consequence of a South China Sea interaction sphere operating from at least 500 BCE, if not from the Neolithic. Such results provide extensive support for the two-layer hypothesis to account for the population history of the region. Am J Phys Anthropol, 2014. © 2014 Wiley Periodicals, Inc.
"Principal findings indicated a major dichotomization of the dataset into (1) an early Southeast Asian sample with close affinities to modern Australian and Melanesian populations and (2) a very distinct grouping of ancient and modern Northeast Asians". That has actually been widely accepted by most workers in the region for nearly forty years and so it's good to see it finally more widely accepted (presumably). "Distinct patterns of clinal variation among Neolithic and post-Neolithic Mainland Southeast Asian samples suggest a center to periphery spread of genes into the region from Northeast Asia". That too has been widely accepted for some time. It does open the problem of what genetic evidence we see for that expansion. To me the only possible option is the expansion of the Y-DNA O haplogroups. Therefore they can only have originated somewhere north of SE Aasia, not in SE Asia itself. Of course Maju will find this difficult to accept and will no doubt offer some reason to question the findings. Does "non-metric dental trait" mean something like mandibular prognathism? Either you have it or you don't? Did not read the article, but it's not clear from the abstract how they got a metric result from non-metric traits. A two-layer hypothesis with one layer being Austro-Melanesian and the other being "modern East Asian" potentially impacts questions like what it means to date a West Eurasian-East Eurasian divergence which is often estimates based upon a simplified single schism model. "potentially impacts questions like what it means to date a West Eurasian-East Eurasian divergence which is often estimates based upon a simplified single schism model". The new Y-DNA K analysis alone shows that divergence to be far from simple, yet again. To sum up, the yDNA vectors of northern features in China seem to be O3 and C (C3?). You would probably like to add N in that list, but remember that Mongol N is N1c and N1b which are absent in most parts of China.I would guess that C3 was the first haplogroup to spread northern genes from north to south and O3 followed suit. However, there are different waves of O3, for example O3d is typical of Hmong-Mien populations. The Sinodont pattern has also been found in the Upper Cave crania in North China (c. 34000-10000 BP): “Past research by the senior author (Turner) indicates that Upper Cave Zhoukoudian specimens display a distinct dental morphological trait pattern known as Sinodonty, a dental pattern shared with other north Asian and north Asian-derived populations. (Christy G.Turner Ⅱ,Yoshitaka Manabe,Diane E.Hawkey, The Zhoukoudian Upper Cave Dentition, 2000). On the basis of this, my understanding is that the Sinodonty developed in Siberia during the Upper Palaeolithic. The Sinodonty may in fact have arrived in North China with yDNA Q, as it is usually postulated that it arrived through Altai. We must bear in mind that yDNA Q has been found in ancient remains in North China and today its frequency is even 10% in Gansu Han. The other possibility is the arrival of C3 via the northern route. It is well-known that yDNA C3 reaches very high frequencies in typical Sinodont areas such as Mongolia, Korea, Amur and Okhotsk Sea area. O haplogroups that are found in Sinodont areas are O2b and O3. According to the Shi et al paper, northeastern O2b-M176 is among the oldest O haplogroups (found in the Yellow Sea area, divergence time between northern O2b and southern O2a is 21 kya), while O3-M117+ (age estimation 13.3 kya) seems to have expanded from the Yellow River Basin. I find it plausible that these O3-M117 and O2b-M176 bearing people mixed with Sinodont people and became vectors of this trait both in China (O3-M117) and in Korea and Japan (O2b). I do not think that YDNA N is a major player in the origin of Sinodonty because it seems to be younger than other above mentioned haplogroups and it originated in southwest China and is not found in America. North China and Mongolia are Sinodont areas, but Hong Kong, South China proper, Philippines, recent Southeast Asia, Burma, recent Indo-Malaysia are still Sundadont areas and all these areas are dominated by yDNA O. Moreover, I have not seen scientific papers that suggest a northern origin for yDNA O. "Terry, there is haplogroup O both in the north and in the south, so it does not explain much". It actually explains a considerable amount. We know there was a southward movement of the Mongoloid phenotype during Neolithic times. Therefore we would expect to find genetic evidence for that movement. The only possibility is Y-DNA O, especially O3 (unless you can come up with a credible alternative). The presence of O in southern China and SE Asia is easily explained as being a product of that movement. "The highest O frequency is in Taiwanese aboriginals, 100%"
Which is more than likely the result of the island of Taiwan being virtually uninhabited until O's southward movement. We certainly have plenty of evidence that the Austronesian expansion began there, and that didn't start until some 5000 years ago. "O1 is clearly a southern haplogroup (Austronesian haplogroup?)" Yes, from 5000 years ago. O1 looks actually to have originated somewhere round the mouth of the Yangtze and spread south from there. "O2 is more frequent in the south (M95 Daic haplogroup in China?, Austro-Asiatic haplogroup in Indo-China?)" Only if you totally ignore O2b. O2 as a whole looks to have originated somewhere in the middle region of the Yangtze and Yellow Rivers, exactly where the Chinese Neolithic began. O2b moved north and O2a moved south, with the Neolithic. "O3 may have spread from north to south with Han Chinese"
"C is more frequent in the north than in the south"
Depends which C you're talking about. C1 is southern and C2 is northern. C2 in the south was almost certainly part of the same southward movement that carried O south. C1 split from C2 long before that, even reaching Australia by 45-50,000 years ago. "N is quite evenly distributed except for Taiwanese aboriginals, but more frequent in the west than in the east"
N is hardly present in the south at all and looks to be entirely northern in origin. "there are different waves of O3, for example O3d is typical of Hmong-Mien populations". Hmong-Mien almost certainly originated in the middle Yangtze and are certainly Neolithic. They have been pushed south into the mountains by later movements of the Han. "the yDNA vectors of northern features in China seem to be O3 and C (C3?)". Those two haplogroups alone are insufficient to explain the almost complete displacement of the early 'Papuan' phenotype through the south. Here you have Orang Asli yDNA frequencies: O1 0%, O2 64.7%, O3 11.8% (M7, M122), total O 76.5%, K-M9 (P397?) 23.5%. So, on the one hand, we have three native Sundadont groups: Aboriginal Taiwanese, Indonesian Iban and Malaysian Orang Asli and they all have a very high frequency of yDNA O (100%, 87%, 77%), and, on the other hand, less original Thais who have in addition to O small frequencies of D, P, F and C, and less original Borneo people who have C*, F, H, K-M526* and R. I do not find it very convincing that it would be in particular in the autochthonous groups that we find a massive amount of recent yDNA. If Sinodont O1 people from the mouth of the Yangtze were the first people to settle in Taiwan, how come they are Sundadonts and less Mongoloid? The highest Y-STR diversity of the ancestral Hg N sub-haplogroups was observed in the southern part of mainland East Asia, and further phylogeographic analyses supports an origin of Hg N in southern China. Combined with previous data, we propose that the early northward dispersal of Hg N started from southern China about 21 thousand years ago (kya), expanding into northern China 12–18 kya. I based much of my reply yesterday on the paper but automatically thought you would have seen it. "Moreover, I have not seen scientific papers that suggest a northern origin for yDNA O". There are several actually but they mostly deal with downstream haplogroups only, ignoring the fact that it is hardly likely any movement south would consist of just single haplogroups. The more basal versions probably accompanied their 'descendant' haplogroups. The above paper demonstrates fairly conclusively that O must have originated at least as far north as the Yangtze, and possibly much further north. "North China and Mongolia are Sinodont areas, but Hong Kong, South China proper, Philippines, recent Southeast Asia, Burma, recent Indo-Malaysia are still Sundadont areas and all these areas are dominated by yDNA O". Because Sundadonty is the ancient state in those regions. Sinodonty has been introduced from somewhere else. Presumably from the north. Another consideration is that the southern people tend towards 'East Asian' phenotype (rather than the apparently 'original' Papuan phenotype) which must also have been introduced from somewhere else. As I said earlier, the only option is Y-DNA O. And don't forget sinodonty is not expressed from the Y-chromosome. "the dental differences between the north China-Mongolia group and all unadmixed Indians is so small compared with the much larger difference between Northeast and Southeast Asians"
I hope you now understand why that difference exists. "Even Ibans who are native people of Borneo and who speak an Austronesian language and who surely are Sundadonts have a very high haplogroup O frequency"
Borneo is particularly interesting as it seems to have been virtually uninhabited until the Austronesians arrived some 4-5000 years ago. That also explains O's extreme presence in Taiwan, the source of the Austronesian expansion, probably no older than a similar date. The Austronesians are a genetic mix of 'Papuan' and 'East Asian', as German commented earlier. This easily explains the combination of Y-DNA O and sundadonty in the island. "my understanding is that the Sinodonty developed in Siberia during the Upper Palaeolithic". "O haplogroups that are found in Sinodont areas are O2b and O3. According to the Shi et al paper, northeastern O2b-M176 is among the oldest O haplogroups (found in the Yellow Sea area, divergence time between northern O2b and southern O2a is 21 kya), while O3-M117+ (age estimation 13.3 kya) seems to have expanded from the Yellow River Basin". The Yellow River is north of the Yangtze and so this fits what I have always said. "I find it plausible that these O3-M117 and O2b-M176 bearing people mixed with Sinodont people and became vectors of this trait both in China (O3-M117) and in Korea and Japan (O2b)". Quite likely but, because there was a minor female component to the Neolithic southward movement the Y-DNAs became disconnected from sinodonty. to modern Austronesian and Daic populations". That is almost certainly before O1 reached Taiwan, or even moved anywhere south of the Yangtze. show only small traces of O3d today". That places Hmong-Mien origins at least as far north as the Yangtze. Whatever the collective origin of O it had diversified geographically by the Neolithic and was closely tied to that Neolithic. It becomes extremely unlikely to maintain an origin for the haplogroup south of the Yangtze. speaking populations in the southwest China (Li 2005). We know the Austronesian and Daic populations in South China and SE Asia are the product of movement from further north. This finding suggests from around the mouth of the Yangtze. So the Hmong-Mien people have been pushed south into mountainous South China by more recent Han expansions. these sites, according to the shared haplogroups". But the three regions mentioned are the northernmost. In fact the northernmost Taosi contains nothing other than O3. Other papers show that the main surviving O3 haplogroups have expanded from the north. It's interesting to note the bifurcation of Native Americans and the grouping with Arctic Siberian and Okhotsk Japan. I wonder which Mexican population they were sampling? It looks like a good case for a separate Aleutian-Pacific Coast migration route. "Principal findings indicated a major dichotomization of the dataset into (1) an early Southeast Asian sample with close affinities to modern Australian and Melanesian populations and (2) a very distinct grouping of ancient and modern Northeast Asians. Distinct patterns of clinal variation among Neolithic and post-Neolithic Mainland Southeast Asian samples suggest a center to periphery spread of genes into the region from Northeast Asia". Obviously a genetic change, for which we should be able to see abundant evidence. We do know even downstream haplogroups within O, especially O3, are very widespread indicating a relatively recent expansion. Do you see any other possibility for a genetic expansion 'into the region from Northeast Asia'? "But humans may have reached Australia via Sumatra, Java, Bali and via Sumba to Timor and Australia. In other words via Nusa Tengarra". That is exactly what the data from the newly-resolved Y-DNA K tells us happened. Of course that route was actually to New Guinea rather than direst to Australia but it is pretty close to what appears now to have been the route. Borneo is off the main route in any case. Kristiina: to my understanding, Q was not found in North China in early and mid-Neolithic sites. It was found in late Neolithic and Bronze Age sites. I don't think Q was responsible for the spread of Sinodonty, given its over all low % in East Asian Sinodont populations, both past and present. C3 is a lot easier to get behind, but again I have to state that C3 isn't found at 'very high levels' in Korean populations. Its average there is 13-16%, while by contrast O is 75-80%, split mainly between O3 and O2b. However, there is an age issue with C3 - see later paragraphs. In both cases, we have to abide the idea that dominant allele behavior was responsible for the spread of Sinodonty by a small % of the population. Otherwise, we have no way to explain the high % of Sinodonty in populations low on C3 and Q.
I think the best argument you've presented is that Native Americans are mainly Sinodonts yet do not share N and O haplotypes. That makes the NO argument for Sinodonty problematic. Yet, it does not preclude a selection model in which both Sinodonty and Sundadonty were present in Paleolithic East Eurasian populations across the haplotype spectrum and that Sinodonty prevailed in the north due to an adaptive advantage. Ultimately, I think that fixating on Y-DNA is not necessarily useful here. Sinodonty is said to have evolved from Sundadonty, yet C3 and Q certainly did not evolve from NO, and vice versa. There is then no need to posit that Sinodont's ancestors were exclusive to one of those haplogroups, and that the trait evolved only when said ancestors reached the center of Sinodont's range today. In fact, given examples of 34-10kya old Sinodonty, why do we think this trait came into being among younger haplogroups ie C3 at all? A model that posits an early presence of Sinodonty in populations across the Y-haplotype spectrum in East Eurasia, followed by intense selection in northern East Eurasia, is capable of solving these problems. "So, on the one hand, we have three native Sundadont groups: Aboriginal Taiwanese, Indonesian Iban and Malaysian Orang Asli and they all have a very high frequency of yDNA O (100%, 87%, 77%)"
What do you see as the problem? Once an immigrant man has children with a resident woman the offsring have only half the man's a-DNA. If a son has the next generation of children with yet another resident woman the immigrant Y-DND will remain but the immigrant a-DNA will be only one quarter of the original. Sinodonty would be a casualty of such an expansion. The fact that The Orang Asli these days contain Y-DNA O in no way indicates it is necessarily ancient within the group. Presumably the 23.5% K-M9 has a more ancient presence in the region. By the way the K needf not be P397 as the more basal K-M526 has been found in Sumatra, just across the Malacca Strait from the Orang Asli region. "If Sinodont O1 people from the mouth of the Yangtze were the first people to settle in Taiwan, how come they are Sundadonts and less Mongoloid?" Are the O1s from the mouth of the Yangtze sinodont or sundadont? "The highest Y-STR diversity of the ancestral Hg N sub-haplogroups was observed in the southern part of mainland East Asia, and further phylogeographic analyses supports an origin of Hg N in southern China". "N*-M231 is presumably the ancestral haplogroup in Hg N, mostly present in southern East Asian populations including Daic, southern Han Chinese, Tibeto-Burman and Hmong-Mien in southern China"
Tibeto-Burman are known to have moved south, as is the male portion of the Southern Han. Daic and Hmong-Mien are known to have become admixed with southward-moving Han. I agree that 'N*-M231 is presumably the ancestral haplogroup in Hg N' but information I have makes it obvious that the haplogroup originated in in northern Sichuan where N1 makes up 30% of the male portion. I notice that region has hardly been sampled at all. On the basis of Hui Li et al 2007 study we only know that there was O1 around the mouth of Yangtze 2100-3300 BC, but we do not know if it was present in Southeast China, except for that, according to the same study, it was not present in Taosi or in Daxi, west and northwest of the mouth of the Yangtze. Neither has O1 been found in other ancient yDNA analyses focusing on North China in which C, N, O3, O2a, Q and R have been detected. The coalescent age of haplogroups O2a1 in Tibeto-Burman populations of Bangladesh is older (14 kya) than in Korean and Japanese populations (10 kya). You are simplifying things with East-Asian - Papuan dichotomy, as according to the recent study “Reconstructing Austronesian population history in Island Southeast Asia”, Austronesians are a mixture between continental East Asians and Negritos, western Indonesians are a three way mixture between continental East Asians, Austro-Asiatics and Negritos, and eastern Indonesians a mixture between continental East Asians, Austro-Asiatics and Melanesians. The recent Karafet paper shows that K2a (NO+X) and K2b (including P,M,S) were brother clades, K2b was in Sunda and K2b on the mainland, and initially they were hardly very different from each other. As K2a spread in Southeast Asia, it probably mixed with people carrying yDNA D and C (+ some continental archaic mixtures), and this may have caused the differentiation of southern Mongoloids. Similarly, the northern Mongoloids probably developed as a mixture between southern Mongoloids and people from Siberia. Later on, there were surely population flows from south to north and from north to south. I agree with you that there surely was this southern Mongoloid “invasion” to the islands and Malay Peninsula which caused people to look less Negritos. “There are four dominant Y chromosome haplogroups in East Asians, that is, D-M174 (10.72%), C-M130 (12.43%, not including C5-M356), N-M231 (5.96%), and O-M175 (63.75%), which account for 92.87% of the Y chromosomes in East Asia... these four haplogroups have been well studied and show clear southern origin during Paleolithic time. ... Q1a1-M120 and Q1a3*-M346 are the two major sublineages of haplogroup Q, which have similar ages of STR variation [in East Asia], 15.42 and 17.77 Ka, respectively. Q1a1-M120 is an East Asian–specific subhaplogroup. It occurs in most of the NEAS populations. In SEAS populations, it occurs mainly in southern Han Chinese with relatively low Y-STR diversity, implying that the spread of Q1a1-M120 was from north to south likely due to the demic diffusion of Han culture during Neolithic time. Q1a3*-M346 was not detected in the SEAS aborigines with only sporadic appearance in southern Han and Hui. "In both cases, we have to abide the idea that dominant allele behavior was responsible for the spread of Sinodonty by a small % of the population. Otherwise, we have no way to explain the high % of Sinodonty in populations low on C3 and Q". Agreed. Anyway sinodonty is not intimately tied to any particular haplogroup(s). However its spread would certainly have involved the spread of haplogroups carrying it. Unless it spread through selection only, a much slower process. "I am not sure what you mean with this"
I was pointing out that to the north the sinodont population was entering empty land whereas to the south it was expanding through already occupied land. That explains the absence od sinodonty in the south. "Austronesians are a mixture between continental East Asians and Negritos, western Indonesians are a three way mixture between continental East Asians, Austro-Asiatics and Negritos, and eastern Indonesians a mixture between continental East Asians, Austro-Asiatics and Melanesians". Yes, yes, yes. But that is only muddying the waters. Only East Asians from that lot are sinodont. So we still have the problem of how it spread. "O2a was not found from the Taosi site"
Ignoring O2b which is found considerably north of the Yellow River. Presumably and O2 between the two region was replaced by O3's later expansion. "The coalescent age of haplogroups O2a1 in Tibeto-Burman populations of Bangladesh is older (14 kya) than in Korean and Japanese populations (10 kya)". What has that got to do with O2b? O2 is almost certainly associated with Austro-Asiatic and so southern diversification would be older than northern. "O1 distributes along the coast of East Asia, from Manchuria in the north to Malaysia and Indonesia in the south". And the direction of its movement is from north to south. Coastal it probably is, but southern it probably isn't. "The recent Karafet paper shows that K2a (NO+X) and K2b (including P,M,S) were brother clades, K2b was in Sunda and K2b on the mainland, and initially they were hardly very different from each other". That's a bit confusing as you have K2b twice. I presume you mean K2a 'on the mainland'. I agree that K2a/NOs ancestry is some distance south of where the separate haplogroups later spread from. "Here you have Orang Asli yDNA frequencies: O1 0%, O2 64.7%, O3 11.8% (M7, M122), total O 76.5%, K-M9 (P397?) 23.5%". Much the same comments hold for both places regarding O's presence. O is 'ancient' in neither region. O1 almost certainly arrived with the Austronesian expansion, expanding from Taiwan and the Chinese coast no more than perhaps 5000 years ago. O2 is SE Asia is almost certainly associated with Austro-Asiatic speaking people, and perhaps with the late Hoabinhian. Its spread is only a little older than that of the Austronesians. Even though the diversification of O3 may be older than that of any language family its expansion is what is important here. O3's expansion is primarily Sino-Tibetan although O3a2b may be primarily Hmong-Mien. That haplogroup rather than any basal O3 is almost certainly the Orang Asli O3. Borneo O3 could be almost anything. Either way O3 probably arrived in the region after both O1 and O2. Only if you look at the data selectively. N1a-P189 may very well be 'young' as the authors claim. But its ancestor must have separated from the ancestor of all the other N Y-DNAs before they began their own diversification. The haplogroup is very rare but found from Japan to Central Asia, especially amoung the Manchu and Evenks. It is virtually unknown in either SE Asia or South China. N1b-L732 is also very much a 'northern' haplogroup, confined to Siberia. Again a very minor presence found in either SE Asia or South China. Its ancestor too must have separated from the ancestor of all the other Ns before they began their own diversification. That brings us to N1c-L729. It is common in northeast Eurasia though. It must be older than either N1c1 or N1c2. N1c1 is by far the most widespread and diverse N haplogroup but N1c2 is again primarily a Central Asian. The diversity of N in South China is easily explained by the diverse origin of southern groups carrying the haplogroup rather than representing the region of origin. Sorry for yet another comment. "Please check this paper https://www.scienceopen.com/document/vid/e54d4fda-adee-4c6e-aca7-24db56755342;jsessionid=QyzN3PQqObH+ESJFQpR6Jja6.slave:so-app2-prd?0"
I've checked again and finally noticed that the authors use a different classification from what ISOGG does. The latter has the paper's N1b-p43 as N1c2b and their N1a-M128 as N1c2a. In other words they completely ignore ISOGG's N1a and N1b. The authors also have the impossible situation where the derived N1-LLY22g is older, at 21.66±4.48 years, than is the ancestral N-M231, at 16.42±0.94 years. Obviously, then, expansion date is independent of time of separation from 'brother' haplogroups. Individual haplogroups can undergo a considerable period of development in a confined region before they expand and diversify. But this also exposes the reason for apparent greater diversity in southern populations. Selection (or drift) is greater in populations that undergo periods of reduced population size. Such is much more likely to happen in northern populations than in southern ones. "implying that the spread of Q1a1-M120 was from north to south likely due to the demic diffusion of Han culture during Neolithic time". And you are prepared to accept Q1a1-M120 was the only Y-DNA to have participated in that demic diffusion? It is a basic thing in genetic research that the highest frequency does not mean oldest age. Moreover, your logic does not make any sense at all. You admit that 'N*-M231 is the ancestral form and N1 a derived form. Then we know that the ancestral form is present in South China and N1 in Sichuan, and you claim that there was a targeted back migration of N*-M231 from northern Sichuan to South China leaving only N1 in Sichuan and not N*-M231. You seem to argue that Yizu of Butuo who have a frequency of up to 30% of N1 according to Wikipedia live in northern Sichuan. In reality, Butuo country is in southern Sichuan near Yunnan border. However, I agree with you that Yunnan Yi who speak a Tibeto-Burman language may have a northern origin, but a north Chinese origin of Daic and Austro-Asiatic groups who have the highest frequency of N* is not supported by any linguistic research. They show five basal groups: 'Negrito', 'Melanesian', 'Austro-Asiatic', 'Austronesian' and 'Other Asian' basal groups. And there you have it. Negritos are Y-DNA K2(xK2a,K2b), Melanesians are Y-DNA K2b1, Austro-Asiatics are Y-DNA O2a, Austronesians are Y-DNA O1 and continental East Asians are Y-DNA O3. As you say, all populations SE Asian populations are a mix of two or more of those basal groups. It may be relevant to this discussion that in the Zhong paper they also say that "The Han Chinese display a high STR diversity [of C-M217], especially those in the eastern coastal region (0.467) as well as other eastern populations (Korean, 0.463; Japanese, 0.453)". So, this oldest C clade seems to have arisen on the East coast, whether its acestral form arrived there via the southern or northern route. I would guess that O1 came from the south via the coast and may have pushed C-M217 further north. "Then we know that the ancestral form is present in South China and N1 in Sichuan, and you claim that there was a targeted back migration of N*-M231 from northern Sichuan to South China leaving only N1 in Sichuan and not N*-M231". I'm not the only one seeing problems with it. "If N originated in southwestern-southern China 20K ago, why isn't there any N* in Austro-Asiatics when there are in Northern Han and even Altaics?" Don't forget that N is quite a young haplogroup as compared to even O for example. "a north Chinese origin of Daic and Austro-Asiatic groups who have the highest frequency of N* is not supported by any linguistic research". Both languages are accepted as being immigrants from further north than where they're found today though. "and you claim that there was a targeted back migration of N*-M231 from northern Sichuan to South China leaving only N1 in Sichuan and not N*-M231". "We conclude that the peopling of East Asia was more complex than earlier models had proposed—that is, a multilayered, multidirectional, and multidisciplinary framework is necessary. For instance, in addition to the previously recognized genetic and dental dispersal signals from SEAS to NEAS populations, CAS has made a significant contribution to the contemporary gene pool of NEAS, and the Sino-Tibetan expansion has left traces of a genetic trail from northern to southern China". So any N* in southern Sino-Tibetan populations is most likely from further north. "Then we know that the ancestral form is present in South China"
Not only 'South China' as far as I'm aware. It has usually been listed as merely 'Han'. Japan too I think. I think we need further research on the matter. It looks like a good summary! However, I do not understand why you insist on the northern (=North Chinese?) origin of O. Now that Karafet paper is published, I find it more than plausible that O* started to spread from the south through Indo-China or from Bangladesh – Burma area. I do not really understand why all the main haplogroups, O1, O2 and O3, should have originated only in North China (Moreover, it is also against all scientific papers). To me it looks like O3 arose in southwest China, the ancestor of O2+O1 ended up in Laos - North Vietnam area where O2 arose while O1 arose somewhere in southeast China. Also from the linguistic point of view, Tibeto-Burman languages (O3-M117, D, N1), Sinitic languages (O3-M117, O3-M134 (xM117), N1) and Hmongic languages (O3a4-002611, O3-M134(xM117), O3a2b-M7) are supposed to have a northern origin. We also have the Korean language (O2b, C3), Altaic languages (C3, R, N1), Japanese language (D, O2b, C1) and Ainu language (D, C3) in the north. Why also Austronesian (O1, O3a2-P201(xO3a2b-M7, O3a2c1-M134)), Austro-Asiatic languages (O2a, K-M9?) and Tai-Kadai languages (O1, O2a, N*) should have a northern origin? If they are autochtonous to the south, why their modal yDNAs should have a northern origin? "Do you know where those ISOGG N1a P189.2 and N1b L732 and N1b1 L731, L733 clades are found?" "It seems that N1a P189.2 is a Balcan-specific haplotype and N1b L732 may be carried by Drozdowski from Poland". "So, this oldest C clade seems to have arisen on the East coast, whether its acestral form arrived there via the southern or northern route". My guess is northern, and before the EDAR mutation arose because Australian Aborigines are C and don't have the mutation. Australian C is C1, as is South Asian. But C1 and C2 must have originated near each other. My guess is that C was widespread through Central Eurasia before being pushed south by deteriorating climate. "I would guess that O1 came from the south via the coast and may have pushed C-M217 further north". I'm sure that O (in the form of NO) came from the south and separated C1 and C2. We know NO (now K2a?) has SE Asian close relations and more distant South Asian relations. What we don't know is how far NO went before its four-way split. "However, I do not understand why you insist on the northern (=North Chinese?) origin of O". Firstly it is reasonably obvious that the Mongoloid phenotype did not arrive in SE Asia or even in South China until the Neolithic. It is equally obvious that some haplogroup must have been involved in that arrival. O is the only possible candidate. Secondly we know that the Chinese Neolithic began in the hill country region in the middle reaches between the Yangtze and Yellow Rivers, especially nearer the latter. "the Neolithic revolution that seems to have exploded the number of O3 in China". Exactly. That's most likely where O3 originated. "Now that Karafet paper is published, I find it more than plausible that O* started to spread from the south through Indo-China or from Bangladesh – Burma area". The Karafet paper is used an old phylogeny and came out at the height of the 'great southern coastal migration' theory. I remember pointing out the difficulties with the southern origin hypothesis at Maju's blog at the time but can't find the relevant post. "I do not really understand why all the main haplogroups, O1, O2 and O3, should have originated only in North China"
Any other option doesn't fit archaeology. "To me it looks like O3 arose in southwest China"
"Also from the linguistic point of view, Tibeto-Burman languages (O3-M117, D, N1), Sinitic languages (O3-M117, O3-M134 (xM117), N1) and Hmongic languages (O3a4-002611, O3-M134(xM117), O3a2b-M7) are supposed to have a northern origin". That takes care of most O3 haplogroups. It places the origin no further south than the middle reaches of the Yangtze. "the ancestor of O2+O1 ended up in Laos - North Vietnam area"
"We also have the Korean language (O2b, C3), Altaic languages (C3, R, N1), Japanese language (D, O2b, C1) and Ainu language (D, C3) in the north". That places O2b squarely in the north. O2a and O2b presumably split while living within a relatively confined region. "Why also Austronesian (O1, O3a2-P201(xO3a2b-M7, O3a2c1-M134)), Austro-Asiatic languages (O2a, K-M9?) and Tai-Kadai languages (O1, O2a, N*) should have a northern origin?" Because all the O haplogroups must have split within a relatively confined region. You can't have some branches of a haplogroup forming some huge distance from its relation before its relation has even formed. The languages may well be 'autochtonous to the south' (but that is debatable) but the haplogroups cannot be. The origin of Austro-Asiatics seems to have generated some of the most divergent theories, as has YHG O.
Kumar 2007 made some pretty stark claims for AAs to have been aboriginal (65kya) in SEA/EA and the source of HG O. If I understand him correctly, these would have migrated all the way to northern EA and account for the high O3 that later re-expanded southwards. Linguists apparently believe they see AA signatures in a large number of AN and Tai languages, even into island SEA. The present fragmented distribution of AA seems to me quite characteristic of ancient populations largely overrun and marginalised by later groups (hence e.g. the strong O component amongst Thais who took over from Mon). Kumar's sample sizes are good, but it's a shame he did not include Vedda, Darividian-speaking Australoids and other dark-skinned populations. "Kumar 2007 made some pretty stark claims for AAs to have been aboriginal (65kya) in SEA/EA and the source of HG O". Obviously incorrect. If the language family was anything like that age we would not be able to identify it as a language family. "Linguists apparently believe they see AA signatures in a large number of AN and Tai languages, even into island SEA". "The present fragmented distribution of AA seems to me quite characteristic of ancient populations largely overrun and marginalised by later groups (hence e.g. the strong O component amongst Thais who took over from Mon)". I'm also sure that is correct. Just that AA is not particularly more ancient than are the later expansions. "I think that it is stupid and unscientific to claim that only one male haplogroup is responsible for racial traits of a population"
What alternative vector for the phenotype's expansion do you propose?
" as if, in this case, O would have evolved in an isolated reservation"
I proposed some time ago that O, N, C2 and D were all part of a population in which the EDAR370A mutation first became established. It was that population that carried the Mongoloid phenotype. That fact that the population who carried that phenotype south comprised virtually a single group of Y-DNA haplogroups is coincidence. To me the evidence is reasonably strong that south and southwest China was never heavily populated until the Neolithic. Pandas survive through much of the region and even orang-utans and elephants are recently extinct there. The bulk of the south Chinese population are therefore recent arrivals. "considering in particular how mobile and changeable yDNA’s seem to be!" I find it interesting that people are quite prepared to accept major Y-DNA movemennts in Europe and Africa (R1 and E respectively) yet are somehow convinced that East Asian Y-DNAs have remained stationary since the late Upper Paleolithic. "you are free to believe in your own racial theory against all scientific evidence"
What scientific evidence am I ignoring? Y-DNA MNOPS's resolution has opened the curtain on East Eurasian population movements. The Brahmaputra/Ganges Delta region probably did not provide optimum habitat for the first modern humans in Northeast India. Prime real estate was probably fairly open country, what is known as 'mosaic vegetation'. The Himalayas also served to narrow the potential migration route east. Therefore K2-M526 probably emerged into northern Burma from northeast India. Probably coalesced there. Some members of K2-M256 moved south where they formed distinct haplogroups on separate islands along the Sunda chain. But they now make up a minority of Y-DNA in the islands and, at least on the southern end of the Malay Peninsula, K2-M526 has been pushed into more mountainous regions. K2-M526 haplogroups have been largely replaced by the later expansion of haplogroups descended from K2a-M214. Along the narrowest part of the Malay Peninsula K2-M256 has not survived at all. In fact further north even K2a-M214(xO,N) does not survive anywhere. It has been completely replaced by its descendants. We have no way of knowing how many other K2-M256-derived haplogroups have disappeared from Burma and South China. But the absence of basal K2-M256 haplogroups north of the Malay Peninsula is easily explained by later Y-DNA replacement, mostly involving various Os but also D and C to a small extent. We can be reasonably sure that as K2-M256 had moved northwards it was confined to a marrow ecological zone until it reached the more mosaic vegetation, open country, north of the Qinling Mountains. There the population was able to expand and Y-DNA NO was able to diversify. And begin its own expansion. At the risk of being totally boring I'll add a few more comments. "However, you are free to believe in your own racial theory against all scientific evidence"
The three haplogroups involved are O3a1c, O3a2c1 and O3a2c1a. It is reasonable to assume their close relations were also caught up in the same expansion. O3a1c (the most widespread and common O3a1 haplogroup) is often claimed as 'South China', but this last paper has the proportions evenly spread over 'East', 'North' and 'South' China. And the boundary between North and South China is the Qinling Mountains, the catchment boundary between the Yellow and Yangtze Rivers. That leaves North China as quite small region compared to the usual division. And even 'Hmong-Mien' O3a2b-M7 actually has its greatest presence north of the Qinling Mountains (from a very small sample though). Remember that O3a has formed four branches: O3a1, O3a2, O3a3 and O3a4. I have no idea where O3a4 has been found but O3a3 is evidently 'Sino-Tibetan' as well as being present in Japan. That all places O3 squarely in northern China. Ancestral lines are normally replaced by their descendants! And what you say is not true, as there is yDNA X(xO,N) in Eastern India. With respect to this, I would like to know what is the relationship of Burmese NO*-rs9341279 with this X. However, I have the impression that you are making up these putative extinct haplogroups to back up your theory. The population surely exploded with farming but South China has its own Palaeolithic profile. The article “The Palaeolithic in Southern China” details the archaeological and human fossil materials recovered from 17 localities throughout southern China. On page 135, you find a map of archaeological sites and they are concentrated in the southwest China, which is the proposed area of origin of O* and N* in all papers that I have seen, excluding Wei Deng et al, 2004 which proposes West/North origin. On the other hand, the article “Early polished stone tools in South China evidence of the transition from Palaeolithic to Neolithic” describes the polished stone tools technology of South China dating from 21000-19000 to 10000 cal BP. When you look at the maps, you see that Mongolia and the Central Yellow River area, which you propose as the area of origin of NO, have the lowest O frequency (and not particularly high N frequency) and the highest C, Q and R frequency! You seem to claim that O3-P201 – O3KL1 split, O2a – O2b split and N1LLYG – N1(xLLY22G) split all took place during the LGM in the cold and arid steppe environment of Quinlin Mountains (in “Neolithic Super-grandfathers” these splits are dated 18.9, 21.5 and 15.8 kya, respectively). By contrast, Three Neolithic Super-grandfathers study itself argues that “Haplogroup O began frequent splitting into subclades before the LGM. The ancestor of O-M175 suffered an intermediate bottleneck event at 30-25 kya [NB the EXPANSION time calculated for the northern populations from East Asia is just 36 – 24 kya! ], and expanded rapidly at 24.7–21.5 kya, indicating a southern distribution during the LGM. I do not think that all the traits you are talking about (Sinodonty, EDAR and whatever else you have in mind) come from one group but I think that traits appearing in Northeast and Southeast Asians have multiple origins in several and very wide geographic areas. I still propose that the vectors of northern traits in China and Indo-China, including Sinodonty and whatever other traits they had, are mainly derived from C3-M217 and O3-M117, O3-M134 (xM117) and O3a4-002611,of which O3a41 seems to be the typical rice-farming yDNA and O3-M134 (xM117) typical of Han Chinese. In the same way, also Tibeto-Burman populations brought Northern traits from north to south, and in this case the vectors seem to be O3-M117, D1 and N1. Yes, unforgivable error on my part. I should have said Hg O might be aboriginal, not confusing with AAs. So, probably c.35kya and maybe somewhat older like MP[S]? And, OK, Kumar's 65kya could be well out - but then so could many of the other datings. Who are the relic SEA/EA aborigines? There must be some. In fact there are plenty: in the Philippines, Taiwan, South China, SEA, India, Nicobar, Andaman (did I forget any?). Of these, most speak replacement languages and the rest differ greatly from AA - plenty of actual current and potentially lost diversity there, enough to match the age of Hg O, possibly? Coming at last to the AA "family", this is one of the most contentious, precisely because of its lack of structured diversity. If AAs were widespread in Sundaland at the last LGM they would have been the (only?) population devastated by sea-level rise in that region. I just wonder if the attendant migrations and mixing might have produced the present-day anomalous AA family characteristics? Sorry, but I haven't had a chance to take on board your "further thoughts". I'm sure they deserve careful study but (a) they will be very hard work with my limited comprehension and (b) I'm very, very tired. Very likely too, everyone else is fed up with the continued comment and I'd better let it rest there. "Who are the relic SEA/EA aborigines? There must be some". In contrast to the present paper the authors claim: 'Phylogeographic analysis suggests at least 4 detectable colonization events that affected the Orang Asli, respectively dated to over 50,000 years ago, ∼10,000 years ago, the middle Holocene, and the late Holocene' The oldest haplogroups are R21 (related to Australian R12) and M21a. F1a1a along with a few other haplogroups they see as Hoabinhian, from perhaps 10,000 years ago and B5b as an Austronesian arrival. "I just wonder if the attendant migrations and mixing might have produced the present-day anomalous AA family characteristics?" That's what the paper indicates. "If AAs were widespread in Sundaland at the last LGM they would have been the (only?) population devastated by sea-level rise in that region". "The Proto-Mon–Khmer language (Proto-Austroasiatic) is the reconstructed ancestor of the Mon–Khmer languages, a purported primary branch of the Austroasiatic language family. However, Mon–Khmer as a taxon has been abandoned in recent classifications, making Proto-Mon–Khmer synonymous with Proto-Austroasiatic"
"Sidwell (2007, 2009, 2011)[full citation needed] suggests that the likely homeland of Austroasiatic is the middle Mekong, in the area of the Bahnaric and Katuic languages (approximately where modern Laos, Thailand, and Cambodia come together), and that the family is not as old as frequently assumed, dating to perhaps 2000 BCE". "Three Neolithic Super-grandfathers study itself argues that “Haplogroup O began frequent splitting into subclades before the LGM". But haplogroups can 'split' long before they expand. Although splitting usually implies at least some level of expansion. "I do not think that all the traits you are talking about (Sinodonty, EDAR and whatever else you have in mind) come from one group"
The evidence is pretty convincing that in SE Asia they were introduced by a particular group. "I think that traits appearing in Northeast and Southeast Asians have multiple origins in several and very wide geographic areas". The haplogroup distribution shows that mt-DNA varies over the region but O Y-DNAs are widely spread through all of China and SE Asia. That indicates a reasonably recent and rapid spread of Y-DNA over a population of reasonably stable mt-DNA distribution. "I still propose that the vectors of northern traits in China and Indo-China, including Sinodonty and whatever other traits they had, are mainly derived from C3-M217 and O3-M117, O3-M134 (xM117) and O3a4-002611,of which O3a41 seems to be the typical rice-farming yDNA and O3-M134 (xM117) typical of Han Chinese". You may be somewhat correct in that those haplogroups carried the major proportion of northern traits but alone they are not enough to explain the level. They do not make a particularly large contribution to Thai, Malay or island SE Asian populations. Other O haplogroups must have contributed to those traits as well. "In the same way, also Tibeto-Burman populations brought Northern traits from north to south, and in this case the vectors seem to be O3-M117, D1 and N1". "On page 135, you find a map of archaeological sites and they are concentrated in the southwest China, which is the proposed area of origin of O* and N* in all papers that I have seen"
All now extinct, which indicates a relatively small population at the time. "the article 'Early polished stone tools in South China evidence of the transition from Palaeolithic to Neolithic' describes the polished stone tools technology of South China dating from 21000-19000 to 10000 cal BP." I don't see that the article specifies the tools were made by Y-DNA O men. And polished axes appeared in New Guinea possibly before anywhere else and Y-DNA O is still virtually unknown there. "The paper 'Glacial cycles and Palaeolithic adaptive variability on China’s Western LoessPlateau' is interesting, as that area seem to be same you are referring to". "Moreover, these North Chinese cultures have their own identity and show similarities with North Eurasian Palaeolithic cultures, e.g. microblade technology. The specimens in the Zhoukoudian Upper Cave, where Native American resembling crania were found, are typical of UP Europe and Siberia"
It is almost certain that the Upper Paleolithic entered China from the north. I would suggest that it was contact with the population carrying that UP that allowed the southward expansion of a northern population (containing Y-DNA O). "you see that Mongolia and the Central Yellow River area, which you propose as the area of origin of NO, have the lowest O frequency (and not particularly high N frequency) and the highest C, Q and R frequency!" C, Q and R are the haplogroups that introduced the UP to northern China and so that makes complete sense. "We therefore propose that this cold but rich environment allowed the demographic expansion of populations who learned to exploit the profuse animal resources, and these people contributed in sufficient numbers to the ancestry of the northern populations we have tested to leave a signature in their paternal lineages. In contrast, this environment did not extend to the southern region, and the populations based there expanded only after the end of the LGM as the climate became warmer and more stable." And probably didn't involve Y-DNA O until the Neolithic. I mention the Hoabinhian in my comment to Paul. I agree it is more than likely that Y-DNA O2a was involved in its later stages. The distribution of O2a coincides reasonably well with the Hoabinhian's extent. But that places O2a's expansion at no earlier than 10,000 years ago, and O2b is very definitely a northern Y-DNA haplogroup. O1's presence in southern China and SE Asia is almost certainly no earlier than the Austronesian/Thai expansion. Southern haplogroups: O1, O2, O3d"
O3d is 'southern', on its own? The 'southern' O2 is obviously O2a, not O2 as a whole. "When you look at the maps, you see that Mongolia and the Central Yellow River area, which you propose as the area of origin of NO, have the lowest O frequency"
"all of the northern estimates lie between 22 and 34 KYA, while all of the southern estimates are between 12 and 18 KYA. These suggest that the northern populations started to expand before the LGM (∼18–21 calendar KYA), while the southern populations started to expand after it". The expansion becomes progressively younger from north to south. Are you suggesting the earlier expansion had no genetic influence on the second? I find that difficult to believe. The high altitude genetic adaptation is said to have introgressed into the modern human line, possibly in the same region as the EDAR mutation. Y-DNAs D1 and D3 presumably picked up the high altitude gene as well as the EDAR before being able to enter the Tibetan Plateau. "Southern haplogroups: O1, O2, O3d"
I notice O3d is now O3a2b-M7, a haplogroup usually described as 'southern' because it is noticeably present in the Hmong-Mien. It makes uo one third of the 5.5-4.5 kya. Daxi Neolithic at the Three Gorges region of the Yangtze. That is hardly a convincing case for O3a2b's 'southern origin'. All in all the Ordos Plateau/Yellow River region north of the Qinling Mountains was apparently a major centre of expanding influence over a considerable time. Again we see that terryt tries to associate the Mongoloid phenotype and Sinodonty with haplogroup O. First of all, I think that associating physical characteristics with a single Y-chromosome haplogroup is a flawed assumption, because Y-chromosome only accounts for a tiny teeny fraction of our genes. Secondly, you have to explain the reason why native Siberians and native Americans, despite having little or no haplogroup O, still exhibit Mongoloid phenotypes and sinodonty. Thirdly, I have not seen any paper that suggests a northern origin for haplogroup O. And recent discoveries even reinforce the southern origin of O, such as NO being a descendant of K2 and NO have a relative X in South India. O reaches its highest diversity and highest frequency in southern China and Southeast Asia, suggesting a possible origin around those places. I do not think that the difference above is so significant that it allows us to make claims about the origin of M7. So, these results are applicable in particular to the Han Chinese and not to the Chinese minorities. If K2a came from the south, either D or C/C2 may have had a northern origin and they/it may have carried northern traits from north to south. For example, ydna D1 may have had a considerable effect in Indo-China, and in Thailand in particular. No, just the opposite and I am expecting the results of Ust Ishim man to shed us more light on the identity of these northern populations. "First of all, I think that associating physical characteristics with a single Y-chromosome haplogroup is a flawed assumption, because Y-chromosome only accounts for a tiny teeny fraction of our genes". I have never associated the Mongoloid origin with a single haplogroup. What to me is obvious is that it originated in a single region and spread from there. It was carried with the haplogroups that had picked it up in that region. "Secondly, you have to explain the reason why native Siberians and native Americans, despite having little or no haplogroup O, still exhibit Mongoloid phenotypes and sinodonty". Well, there you go. You've just destroyed your first comment. "I do not think that the difference above is so significant that it allows us to make claims about the origin of M7". Possibly so. But it certainly doesn't allow us to conclude a southern origin. "If K2a came from the south, either D or C/C2 may have had a northern origin and they/it may have carried northern traits from north to south". Possible. But those haplogrpoups make up such a small minority in South China and Southeast Asia that they alone seem insufficient to explain the level of southern Mongoloid characteristics. Although selection might explain the northern presence selection cannot explain the level in the south. "For example, ydna D1 may have had a considerable effect in Indo-China, and in Thailand in particular". Well, interestingly Thailand seems to have a smaller level of the Mongoloid phenotype except for what seem to be more recent arrivals there. And we know such recent arrivals carried a fair level of Y-DNA O. And D in the Andaman Islands is certainly not associated with a Mongoloid phenotype. "I am expecting the results of Ust Ishim man to shed us more light on the identity of these northern populations". I will be extremely surprised if it carries the EDAR370A mutation for example. That mutation must have been spread by something. you are the one who keeps mentioning how haplogroup O is associated with the Mongoloid phenotype. I'm just asking you why there are Mongoloid populations who have little or no haplogroup O at all. It's a valid question. "Well, interestingly Thailand seems to have a smaller level of the Mongoloid phenotype except for what seem to be more recent arrivals there. And we know such recent arrivals carried a fair level of Y-DNA O. And D in the Andaman Islands is certainly not associated with a Mongoloid phenotype." I don't think D1 is a native of Thailand or of Southeast Asia. D1 is mostly found among the Tibeto-Burman populations of western China. And the D1 found in Thailand seems to be mostly restricted to northern Thailand, which indicates that it might be brought there by the Tibeto-Burman populations who were expanding from southwest China. Northern Thais certainly look much more Mongoloid than the southern Thais with high frequencies of O2a. D and C might not be Mongoloids, but their descendants D1 and C3 are certainly Mongoloid haplogroups. I don't understand why you keep mentioning O as the most Mongoloid and yet ignoring other Mongoloid haplogroups. If we imagine a situation in which O is spreading northward from Indo-China and meets people with yDNA C and D, it mixes with them (with only females of course! ), the result is that O carrying men start looking like yDNA C and D carrying men. In this way, it is very easy to explain the southern Mongoloid traits as a mixture between previous populations and the O population. Moreover, it is possible that O mixed with a population high in D in the west and with a population high in C in the east. The Andamanese D does not need to represent the original phenotype of yDNA D. It is possible that their looks come mostly from the female side. "I'm just asking you why there are Mongoloid populations who have little or no haplogroup O at all. It's a valid question". Agreed. I have tried to explain several times that haplogroups do not automatically coincide with phenotype. As I said the other day: 'What to me is obvious is that the Mongoloid phenotype originated in a single region and spread from there. It was carried with the haplogroups that had picked it up in that region. The populations that carried it north did not have O. Rather they had C2 (new phylogeny) and N. The population that moved south must have carried O. "I don't understand why you keep mentioning O as the most Mongoloid and yet ignoring other Mongoloid haplogroups". I'm considering mainly the southern Mongoloids as they are the population I am most interested in. I see no other option but O as the only possible vector for the entry of the Mongoloid phenotype into South China/Southeast Asia. I agree with your comments concerning a Tibeto-Burman element in northern Thailand. "If we imagine a situation in which O is spreading northward from Indo-China and meets people with yDNA C and D, it mixes with them (with only females of course! ), the result is that O carrying men start looking like yDNA C and D carrying men". So how does the Mongoloid phenotype move south against the main genetic flow? "In this way, it is very easy to explain the southern Mongoloid traits as a mixture between previous populations and the O population". I can't see how you come to that conclusion. You propose no vector for any possible southward movement. There is no 'mixture' involved at all anywhere the Mongoloid phenotype is considered to be a Neolithic arrival. "I agree about the EDAR: it must have originated in the east, but it is still possible that the Ust Ishim yDNA developed EDAR in the east (although I am not at all claiming so)"
Ust Ishim is much to old to carry the mutation as we understand the dating at the moment. EDAR370A is some 35,000 years while Ust Ishim is 10,000 years older. Andaman D is not D1, To me D1 and D3 are closely associated with a Mongoloid phenotype. But the other D's are not necessarily so closely associated with it. D2 reaches 35% of Ainu, who are, or at least were, certainly less Mongoloid than their neighbours. And D4 in the Philippines seems associated with people of pre-Mongoloid origins. Which suggests to me that Andaman D* had departed from D's homeland before the Mongoloid phenotype became established in the haplogroup. We know that N and the three O haplogroups have a common ancestor: NO or K2a-M214. The currently accepted date for the NO most recent common ancestor is 33,000 years. Surprisingly close to the date postulated for the EDAR370A entry into the modern human gene pool. The K2b haplogroup (which includes P) TMRCA is considerably earlier, at 44,000 years. The whole K-M9 TMRCA is 47,000 years. K2a's ancestor (or NO's) must have separated from the rest of K-M9 at some time between those last dates. That leaves roughly 10,000 years for K2a-M214's ancestor to have expanded considerably from wherever K2-M526 entered East Asia. We know separate haplogroups formed as K2-256 had become isolated on what became (or already were) separate Southeast Asian islands. But we have no way of knowing if K2(NO)'s ancestor remained just north of the Malay Peninsula for a further 10,000 years. I would think it extremely unlikely that conditions on the East Asian mainland were the same as those in Sunda. Just one basal mainland K2-M526 haplogroup remains on the mainland: K2a-M214, otherwise known as NO. The fact that O's greatest diversity is apparently in southern China rather than in northern China can be the product of several factors. On its own it cannot be claimed as 'proof' of a southern origin. As far as I'm aware there are no basal O haplogroups confined to Southeast Asia, or even to South China. Surely we would expect to find obvious examples if early NO haplogroups had spread through the region. The nearest we come to to such a haplogroup is O1. It was definitely present around the mouth of the Yangtze 5300 years ago in the Liangzhu. That is somewhat before it is suspected of being part of the Austronesian/Daic language expansion of 4000 years ago. The Yangtze is often regarded as the boundary between northern and southern China. I'm quite prepared to accept a Lower Yangtze origin for O1. In which case its origin is on the boundary between North and South China. The next most likely candidate for a southern Chinese haplogroup is actually O3a2b-M7, not O2. Although O2a is obviously 'southern' O2b certainly isn't. O2a too has a Neolithic presence on the Yangtze, most notably in Wucheng at 3500 years. The haplogroup has an even earlier Neolithic presence, although a lower proportion, 6500 years ago amoung the Daxi at the Three Gorges region of the Yangtze. The Daxi are said to be ancestors of the Hmong-Mien, definitely a South Chinese people. But the deeper ancestry of the O2 haplogroup lies at least north of the Yangtze. O3a2b-M7 is particularly common in the Hmong-Mien and made up one third of the Daxi at the Three Gorges 6500 years ago. That makes O3a2b the most basal O with any sort of 'southern' distribution. But O3a2b is just one of three O3a2 haplogroups, which in turn is just one of four O3a haplogroups. O3 has spread widely through China but I am sure that spread is a product of the Neolithic, not evidence of an ancient expansion. Certainly the presence of O3a2c-P164 in the Pacific can only be a product of the Neolithic. O3 is in general closely associated with Sino-Tibetan speaking groups. I think it is almost certain that haplogroup O3 and the Sino-Tibetan languages originated in the same place. In fact I suspect there has been a long series of expansions from the same region including N, O1, O2 and O3. And probably D1, D3 and C2 as well. There seems to be no uniform ”Mongoloid” layer common to all East Asians. However, it is possible to distinguish the light yellow Northeast-Asian from the dark yellow Southeast-Asian component. It is probable that Sinodonty developed within the northern, light yellow cluster. It seems that after the Ice Age, there has not been much admixture between the Northeast and Southeast. If there was a flow of N and C2 to the northeast it cannot have changed compeletely the looks of Northeast-Asians, and note that Chukchis who do no seem to have any ”Chinese” yellow or Turkic, Mongolic or Nganasan colour still look very Northeast-Asian. 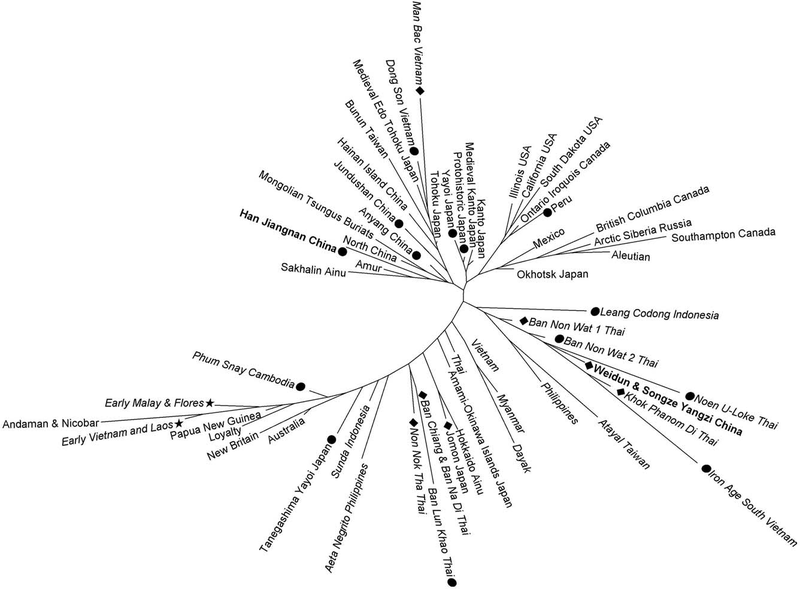 There must have existed an old Northeast-Asian cluster at an early date that expanded in the north c. 36 – 24 kya. I do not really think that ydna O or N were there at that time. "There seems to be no uniform 'Mongoloid' layer common to all East Asians". "it is possible to distinguish the light yellow Northeast-Asian from the dark yellow Southeast-Asian component". Yes. Because Southeast-Asians are mixed with a different population from that of Northeast-Asians. But that doesn't mean at all that the phenotype the two regions have in common does not have a specific and common origin. Human groups have been moving around continuously. Interesting that people are quite prepared to accept that Europeans a re the product of a complex series of mainly Neolithic population movements yet are extremely reluctant to accept a similar process has been involved in East Asia.
" It seems that after the Ice Age, there has not been much admixture between the Northeast and Southeast. If there was a flow of N and C2 to the northeast it cannot have changed compeletely the looks of Northeast-Asians"
But we know that MA-1 was not Mongoloid. How do you reconcile that with your statement? Something changed 'the looks of Northeast-Asians'. area was “inhabited by a population of Mongoloid appearance." "we really do not know that MA-1 was not Mongoloid!" If MA-1 is indeed Mongoloid it would be by far the earliest example yet found. "Debetz (1946) identified the remains of 'nothern Asian Mongoloids' at the site of Afontova Gora 2"
"The interesting thing is that MA-1 does not appear to be East Eurasian, as proven by the test D(Papuan, Han; Sardinian, MA-1) which is non-significant, so MA-1 is not more closely related to Han than to Papuans"
"Also, can we now finally bury the debate when east and west Eurasians diverged? Obviously it can’t have been that recent if a >20,000 year old individual had closer affinity to western populations". All in all it seems very unlikely MA-1 was 'Mongoloid'. Mongoloid traits are mainly skeletal traits. They are not the same as Han Chinese DNA, let alone the same as yDNA NO. We cannot derive Ma-1's skeletal features and looks from his yDNA or genetic composition. To assess whether MA-1 was Mongoloid or not, we must look at his bones and not his yDNA. you see that Altaians and Shors carry for the most part Northeast Eurasian DNA: c. 55% of Turkic-Mongol ancestry (East Siberian ancestry), 25% of Ket-Nenets-Nganasan ancestry (West Siberian ancestry) and 20% Volga-Uralic,Russian and Indian ancestry. Shors have 80% of yDNA R+Q and among other Altaian groups R+Q ancestry is as follows: 47%,65%,67%,68%,70%,76%,78%,80%. We might also claim that R-Z93 is the original vector of Turkic ancestry in Eurasia. Paul White, i'm Adrian from Indonesia. Before i share my thought, can you tell me your theory about all thinks of Y Hg O-M175? To be honest, these netizen comment about this topic is unforgivable because almost all of these netizens have own "opinion" about these topic. This Anthropology website isn't a scientific education anymore, just a "know at all", illogical and a racism plus a Chaovinism netizen. I want to discuss a human haplogroups with you, Paul White, to sharing and learned this knowledge to find the thruth. Thanks!